Defense Secretary Leon Panetta used a Pentagon ceremony for the new Medal of Honor recipient Wednesday to sing the praises of special operations forces. President Barack Obama awarded the Medal Honor to Sgt. 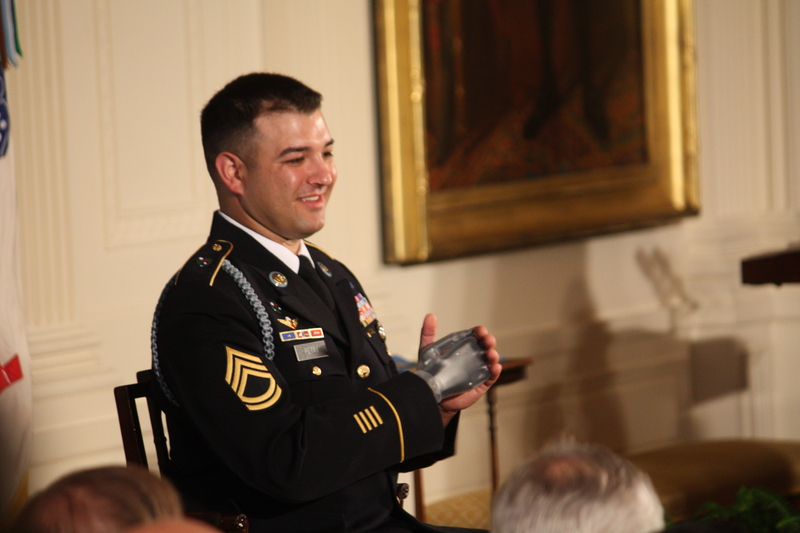 1st Class Leroy Petry at the White House Tuesday, and he was added to the Hall of Heroes at the Pentagon. "A member of the U.S. Army's storied 75th Ranger Regiment, Sgt. Petry's actions speak to the extraordinary accomplishments of the special operations forces that have been at the center of the fight this past decade," Panetta told the Pentagon ceremony Wednesday. Petry lost his hand but saved the lives of nearby buddies when he tossed away a grenade during a fight in an insurgent compound in Afghanistan in 2008. "Like many of his brethren in Special Forces, Sgt. Petry has deployed multiple times since 9/11. He has had eight combat deployments - six in Afghanistan, two in Iraq," Panetta said, just back from his first visit to both Afghanistan and Iraq as Defense Secretary. "Today, as we honor him, we are mindful of the great burden and the heavy costs that fall on this community of warriors - every day and more often every night - as they relentlessly pursue the country's most dangerous enemies." Panetta praised special operations forces for the successful raid on the Osama bin Laden compound in Pakistan and the killing of the al Qaeda leader, and said he had been given "a little trophy" - a brick from the compound, which he called a symbol of the tremendous work of special forces. The Pentagon auditorium was filled with top Pentagon brass, former Medal of Honor winners, Petry's family and many of his Ranger buddies, standing out in the dres- uniform crowd with their spit-shined black jump boots. "They have made a real difference in the fight against terrorism," Panetta continued with his praise of special operations. "Every time they go out on an operation, they face huge risks - the risks of being caught in a fire fight, the risks of suddenly being attacked, the risks of facing uncertain consequences in entering a compound that they have no idea who's there and what they might do," Panetta said. "And yet they respond, they respond with bravery, they respond with discipline, and they respond with the kind of heroism that Sgt. Petry was able to reflect on that operation. It cost him a hand but it saved the lives of others." Petry modestly accepted the honor on behalf of his fellow Rangers and others in the Armed Services. In a later briefing, he described that Memorial Day in 2008 that started with a rare daylight raid to locate a "high-value target" in Afghanistan. In the midst of a firefight, already wounded in both legs, Petry saw an enemy grenade roll within a couple of feet. "Immediate reaction was to get it out of there, get it away from the guys and myself," Petry said. He grabbed it, threw it away and just as he opened his hand to release it, it exploded, severing his hand at the wrist. He recalled how he didn't feel pain immediately and noticed for a split second how it only oozed blood in an un-Hollywood way. He applied his own tourniquet and continued the fight. It was a combination of miracles, Petry says now, that the bullet that wounded him in both legs didn't server an artery, that the grenade that went off at arm's distance didn't kill him or the other Americans. "Two miracles in one day," Petry said. "And the third miracle was the two guys next to me are alive and well." Petry has stayed in the service and is now counseling other Rangers. He said his prosthetic hand - actually uses two different models - is great. "It's never going to be as fast as a real hand to pull a trigger or bounce a basketball," he said. But "I just about have done everything I want." He boasts that he has knife attachments that he uses when cooking for the family. And a golf-attachment has allowed him to take up a new sport. And he said he was moving forward with his life, even as he is recognized and congratulated as the United States honors only the second Medal of Honor awarded to a living service member since Vietnam. "I am still me," he said. The medal is just a decoration they thought I deserved."